Face gears are the gear wheel with cogs mortised into its face, usually in conjugation with a lantern pinion. Face gear enables the transmission of drive through an angle. Their use in high power, high precision applications have become popular. Face gears have high strength teeth and good contact geometry, which give high torque capability. Face gears help to ensure accuracy and rigidity. It is generated by a shaper cutter with the same diametrical pitch and pressure angle as the pinion. Pressure angle of a face gear is calculated by calculating the shape of the tooth, the frontal pressure angle. 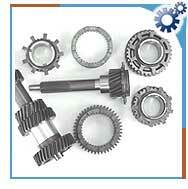 Face gears are of three types; standard face gear, helical face gear, and offset face gear. Face gears have many advantages. The pinion is a normal spur gear and assembly time is reduced because only the axial position of the face gears needs to be set. In this there is no axial load on a pinion with straight spur teeth and the meshing is smoother due to oblique contact lines and high contact ratio. It can easily obtain zero backlash transmission.